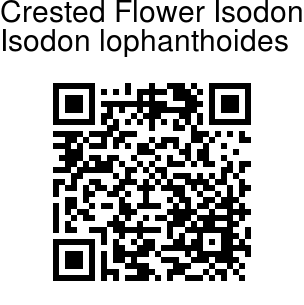 Crested Flower Isodon is a small perennial herb, growing up to 1-5 ft tall. Oppositely arranged leaves, 5-10 cm long, are ovate, pointed tipped, toothed, hairy beneath. with rounded base, carried on 1-5 cm long stalks. Flowers are tiny, borne in branched cymes forming a panicle at the end of branches. Cymes are helicoid, 11-13-flowered, carried on stalks. Sepal cup is bell-shaped, about 2 mm, 1.7 mm wide at mouth. 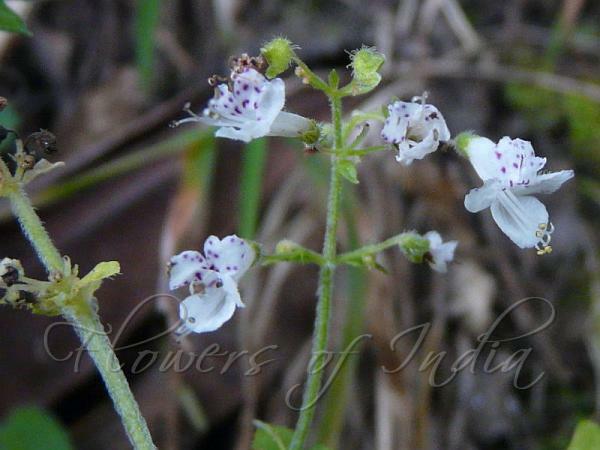 Flowers are white or rose, with purple spots on limb, 2-7 mm. Tube is 3.7-5 mm, straight; upper lip 1.6-2 mm, lower lip slightly longer. Stamens and style protrude out. Crested Flower Isodon is found in the Himalayas, Western Ghats, at altitudes of 400-3000 m. Flowering: September-November. Identification credit: Prashant Awale Photographed in Dhanaulti, Uttarakhand & Ailawng Mizoram.